The Elasmosaurus (el-lazz-mo-sore-us), more commonly known as the Plesiosaur (PLEE-see-uh-sore), is one of the marine Reptiles in ARK: Survival Evolved. Elasmosaurus remuspissa is typically found in the deep oceans, and has a strange role in the oceanic food chain. It almost exclusively hunts the smaller creatures in the waters, leaving most even moderately large creatures alone. The sheer size of the Elasmosaurus means that the quantity of food it must eat to sustain itself is nothing short of enormous. Elasmosaurus is a formidable fighter. Aside from the Megalodon, I have only ever seen two creatures bring down an Elasmosaurus: a Mosasaurus, and human beings. Though I will admit, I have yet to thoroughly explore the staggeringly deep underwater caverns surrounding the Island. Much like the Brontosaurus on land, Elasmosaurus is an excellent way to transport large quantities of goods over water. These powerful creatures are in fact so large that they can be used as mobile water bases. Ambitious tribes sometimes build bunkers right onto the backs of Elasmosaurus instead of building cargo ships. Plesiosaurs swim around in groups of two or three in the depths of the ocean, never surfacing. When players get too close, they start to attack and will follow them for a short distance; they seem to lose interest quickly, especially when swimming vertically. The Plesiosaur has an almost teardrop-shaped body. Its size, long neck, and four whale-like flippers make it unmistakable for any other creature. The neck itself makes up half of the creature's length, and the mouth is lined with many sharp teeth. Commonly found in pairs, this large marine reptile hunts in the island's deeper waters for fish and squid, working as a team to corral their prey. Despite their size and often camouflaged coloration, Plesiosaurs are sometimes preyed upon by other large marine predators and, occasionally, adventurous Spinosaurus heading out from the coast. This section displays the Plesiosaur's natural colors and regions. For demonstration, the regions below are colored red over an albino Plesiosaur. The colored squares shown underneath each region's description are the colors that the Plesiosaur will randomly spawn with to provide an overall range of its natural color scheme. Hover your cursor over a color to display its name and ID. For example, "cheat SetTargetDinoColor 0 6" would color the Plesiosaur's "body" magenta. This section describes how to fight against the Plesiosaur. It is recommended to fight in a group against a Plesiosaur. If alone, a powerful water mount or SCUBA Flippers can be invaluable. Remember that there will be two and possibly more(so far, the highest recorded amount around a single sea cave has been six individuals) attacking, so keep this in mind. 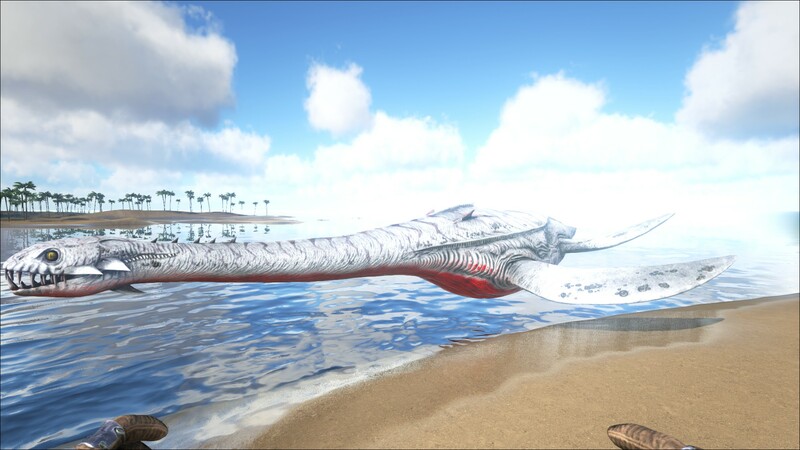 As the Plesiosaur will only reach up to a certain height, you may be able to swim above where it won't reach and shoot down. Make sure during a battle that other creatures in the water do not attack as well. Megalodon and Dunkleosteus in the area will prove deadly and a Mosasaur can ruin the adventure if it is gone unnoticed. With SCUBA Flippers it is easy to keep swimming above it and it will only rarely take a hit on you. The crossbow is most recommended for ranged attacks, as it can be fired underwater. Melee weapons can be used, but are not recommended, due to the Plesiosaur's attack range and AOE (Area Of Effect). A melee battle will almost always end in the Plesiosaur's favor. But if you have a crossbow, then you have the advantage against the Plesiosaur instead of the other way around. 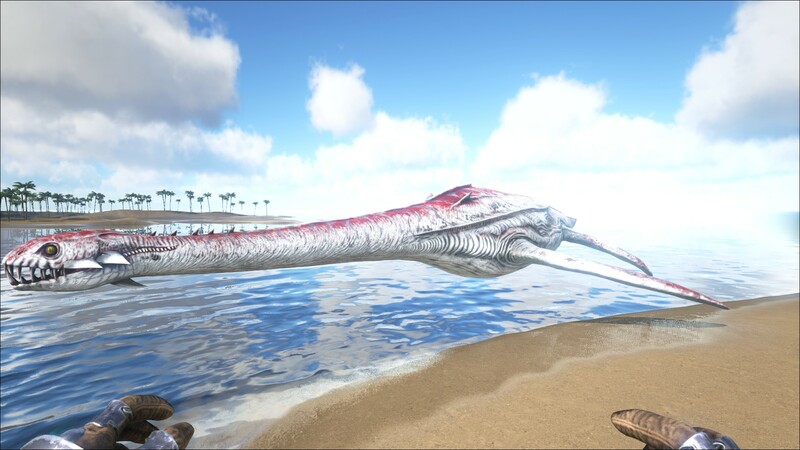 As a larger creature, the Plesiosaur has a bigger attack range, giving it a melee advantage. Try using crossbows when attacking it. Beware of other creatures in the area. Staying too close to the sea floor can expose the player to the poisonous sting of a Eurypterid, which neutralizes the player completely. Such a hindering leads to certain death. Although very large, the Plesiosaur can be weak if trapped inside cave mouths. This can be useful for both killing it or taming it. The taming of the Plesiosaur is by far one of the most difficult in the game. Generally, the Plesiosaur's level seems to create an extreme difference in the resources required to tame. Due to their very fast torpor decrease, you need a large amount of narcotics to maintain a Plesiosaur unconscious. 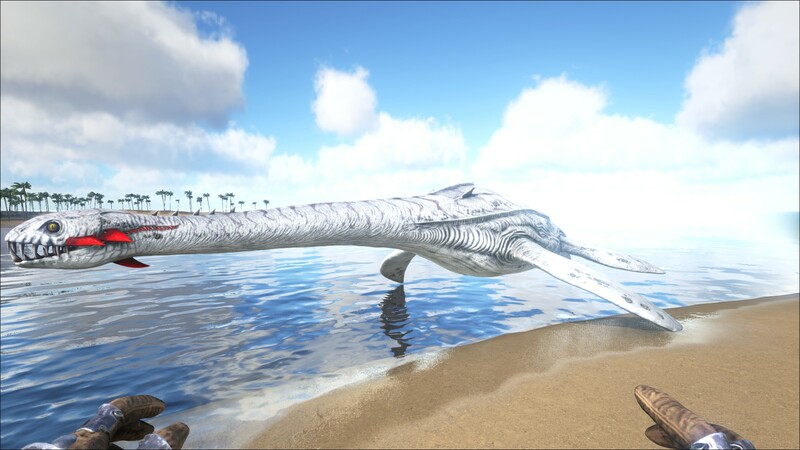 Bows and guns will not work underwater and wild Plesiosaurs will not swim to the surface of the ocean, so you will need to either use a crossbow or lure the Plesiosaur into a cave where they can surface. 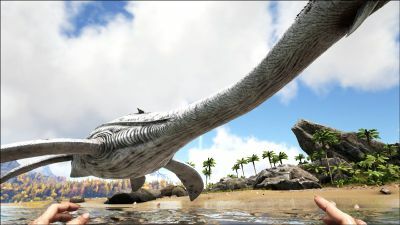 Another technique is to use the crossbow and attack the Plesiosaur from above. They seem to lose interest in you when you're near the surface, this allows you to take shots at them while still moving far enough away to make them lose interest. Repeat this process and you should be able to knock it out without much issue. This still leaves the risk of Megalodons and other Plesiosaurs attacking you and your tame, though, so be cautious. It is also recommended to have a raft with some storage boxes and beds floating above the spot where you are planning to tame a Plesio in case you need to respawn after dying, or you want to store your narcotics and other valuables you don't want to lose. However, beware of the mighty leedsichthys which can destroy a raft extremely quickly, caution is advised. If you lure one to an underwater cave, you can stand inside the cave where you can breathe air and tranq it safely. Then use your Megalodon to hunt for prime meat, and you can tame it very quickly. Mobile Base Platform: The platform saddle can be used to build a mobile aquatic base. Structures do not affect Dinosaur weight capacity, but storage does; increase weight if used for transport (Level up Weight, Speed, and Stamina). Warship: The Plesiosaur has high health and damage, which makes it useful in battle. The platform saddle also allows for cannons and siege weapons, allowing for naval warfare (Level up Health and Damage). Aquatic Tank: Having a high base health, the Plesiosaur can take massive damage (Level Health and Melee Damage). Oil Rig: Due to the fact the Plesiosaur can carry a large amount of weight, you can make it built for collecting enormous amounts of oil and converting it to gasoline. While not an ideal or recommended use, you could also use it for collecting crystal as well (Level up Weight, Damage and Health). Destroyer: Along with its very high speed, good stamina and platform saddle you can put 2 miniguns to both ends of the platform and one rocket turret to the middle, so it can be used to destroy any raft, beach base or other sea animal in seconds and make a speedy escape. The generic name means "thin-plate lizard". The specific name appears to be intended to mean "thick oar" (referring to its flippers), but is incorrectly constructed and of the wrong grammatical gender; the correct form would be spissiremus. The dossier for Elasmosaurus actually mentions the underwater caves found in the game. This also seems to indicate that there are even more fearsome creatures in the depths of the caverns. Due to its enormous size the taming time is extremely long in which it is susceptible to enemies like Megalodons. They might also lower the effectiveness due to possible inflicted damage. Plesiosaurs always drop Firework Flare Gun Skin when killed. Plesiosaurs are pretty rare to find but they are usually near the underwater caves, in numbers varying from about 1 - 4. Despite the dossier stating it leaves most creatures the size of humans and larger alone, it is common for them to attack megaladons and other creatures on sight. Before the introduction of the crossbow, plesiosaurs were usually kited into an underwater cave so that they could be tranqed. The name 'Plesiosaur' refers to a large group of animals that ruled the seas from the Jurassic up to the end of the Age of Reptiles. Genus Elasmosaurus thrived in the shallow seas that covered the central United States during the Late Cretaceous period. The Dossier says that the Megalodon is the only predator of the Plesiosaur, though the latter is mostly stronger. Quite disturbingly the Dossier states that "Have yet to explore ... The underwater caves" directly after talking about predators of the Plesiosaur. This could hint at a new underwater boss or monster of the deep. A similar hint is dropped on the Ichthy's dossier in the form of a giant underwater monster behind it in a size comparison. For players who actually read the dossier rather than just the text on mobile, they can notice that the text says that a Mosasaurus can kill a Plesiosaur, when in fact the dossier says that a Spinosaurus that found its way into the deep killed a Plesiosaur. 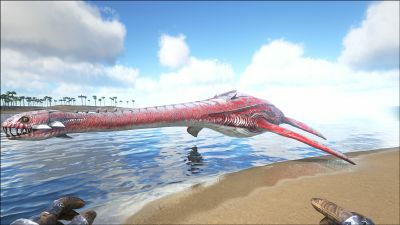 Until v263.0 Plesios always spawned with a minimum level of 35.